Pope Francis' visit explained: Where he's going, what he's doing, and who he is. Pope Francis steps off his plane at Andrews Air Force Base in Maryland on Tuesday. So the pope is visiting? Yes. 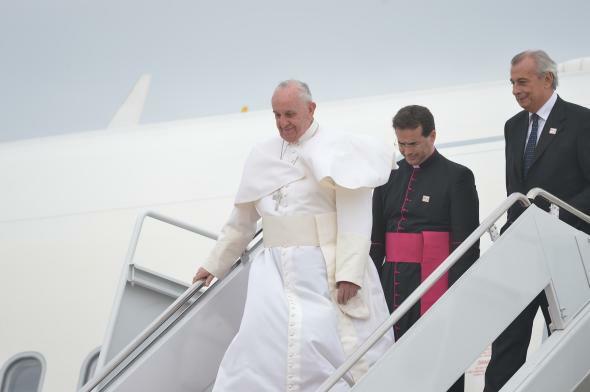 Pope Francis has arrived in the United States via Cuba and will be here until Sunday. He’ll travel to Washington, D.C.; Philadelphia; and New York City to hold Mass, address Congress and the United Nations, and visit with marginalized individuals like prisoners and refugees. He’ll also demonstrate his characteristic personal touch during various other public appearances. Do you have to pay to see the pope? No. Tickets to his Masses at Madison Square Garden and in Washington, D.C., for example, were given away through local archdioceses and can’t be purchased on StubHub. Tickets to his appearance in Central Park were given away by the city in a lottery. Other events—along the National Mall, and on Philadelphia’s Benjamin Franklin Parkway—are open to anyone who shows up. I don’t live in those places. Can I watch the pope on any of my flashing rectangle screens? Yes, the United States Conference of Catholic Bishops will stream video all of the pope’s appearances on its website. His appearances will also air on the cable network EWTN and most of them will be covered on Catholic TV. Time Warner Cable subscribers can see full-time pope coverage on a special Papal Visit Channel. Several of the pope’s speeches/appearances will also be covered on C-Span, and presumably his addresses to Congress and the U.N. will be carried live by cable news networks. Be aware, though, that he’ll be speaking in his native Spanish during most appearances. I don’t like listening to translators. OK. So why is the pope meeting with prisoners? Is he a bleeding-heart liberal and/or hippie freak? Since the early days of Francis’ career as a priest, he’s endorsed the idea that Catholics, especially clergy, should spend as much time as possible on the “periphery” of society with the marginalized and oppressed. During his trip he’ll join homeless and indigent individuals as they eat lunch at a Catholic Charities site in Washington; visit immigrants, refugees, and students at a Catholic school in East Harlem where a majority of attendees receive need-based scholarships; and meet with prisoners at Pennsylvania’s Curran-Fromhold Correctional Facility. But as Slate’s William Saletan explained in his Sunday piece, the pope is still conservative on issues of personal morality, and his stances on economic issues are for the most part no different from those of his predecessors. (Where he does differ from them is in emphasis, having made more of a point of highlighting social-justice topics via public appearances and in his writing.) And as Catholic writer Austen Ivereigh’s biography The Great Reformer details at length, Francis isn’t generally interested in thinking about large-scale economic structures; he’s less concerned about the relative merits of socialism or capitalism than he is about whether individuals are doing everything they can in their own lives to help each other and to think about God. This being the United States, I suspect that people are selling all sorts of gimmicky commemorative items related to the pope’s visit in a way that would seem to undermine his points about not letting money and consumerism dominate every aspect of life. Where will the pope be staying overnight? In Washington, Francis will bed down in the Apostolic Nunciature of the Holy See to the United States on Massachusetts Avenue NW, effectively the Vatican’s embassy. In New York, he will stay at the residence of the Apostolic nuncio to the United Nations. While he’s in Philadelphia he’ll stay just outside the city at the St. Charles Borromeo Seminary. OK. For some of his appearances—along the National Mall and in Central Park, for example—the pope will ride in his popemobile, which is a modified Jeep Wrangler. Francis’ popemobiles, unlike the ones often used by his immediate predecessors, are open-air; he can reach out to give blessings and make other hands-on gestures. Pope John Paul II—who in 1979 pioneered use of the elevated-seat vehicles that we call popemobiles—had a good reason for surrounding himself with bulletproof glass, which is that he was shot four times and severely wounded in 1981 while riding in an open-air modified Fiat. Surprising fact: Previous popes, right up to John Paul I, were sometimes transported via sedia gestatoria, i.e., chairs carried on the shoulders of attendants, as you might see in movies about caravans and ancient Egypt. Being carried by servants—not a great look. Yes, that would be a bit too colonial for the modern Catholic Church. A significant majority of the world’s billion-plus Catholics now live in Latin America, Africa, and Asia. Why is this guy called Pope Francis, with no Roman numeral, instead of Pope Something XVI? Francis was born Jorge Mario Bergoglio in 1936 in Buenos Aires to parents from Italian immigrant families. He took the name Francis, he says, to honor St. Francis of Assisi, the 13th-century saint who is said to have given up his inherited wealth to live and work among the poor. Since no previous popes have taken that name, he requires no Roman numeral. Do all his old friends have to call him “Pope Francis” now? No. Papal spokesman Manuel Dorantes told me that the pope is happy to be addressed as Padre Bergoglio, his title since he was ordained as a priest at age 32 in 1969. Is his legal name “Pope Francis”? 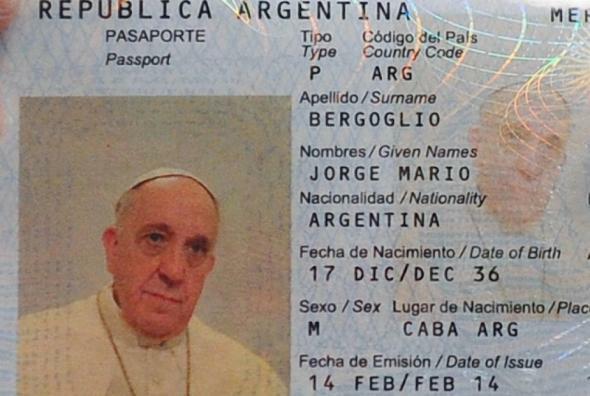 Yes, that’s what’s on his Vatican City passport. He also still holds an Argentine passport under his given name. Does every pope visit the United States? Since Paul VI became the first to do so in 1965, each pope except John Paul I (who was pope for only 33 days before his death) has made at least one trip to the U.S. John Paul II, the most widely traveled pope, came here seven times. Does the pope get a paycheck? Does he get health insurance, at least? Like all Vatican employees, the pope receives health care from Vatican Health Services. Who hears the pope’s confessions? There’s no formal system or appointed confessor, but Francis says he confesses every two weeks and did so in view of cameras and the public in St. Peter’s Basilica in 2014. How often does Pope Francis speak to his predecessor, Pope Benedict XVI? Formal meetings between the two are rare, and Benedict, who was the first pope to resign in over 500 years, keeps a low public profile. But Benedict still lives in the Vatican in a monastery called the Mater Ecclesiae, and Dorantes says Francis visits him there frequently. Which old-time pope had funniest name? Which old-time pope had the most hilarious name? One more question. If the pope touches you in Philadelphia and you are an Eagles fan, will the Eagles start winning?